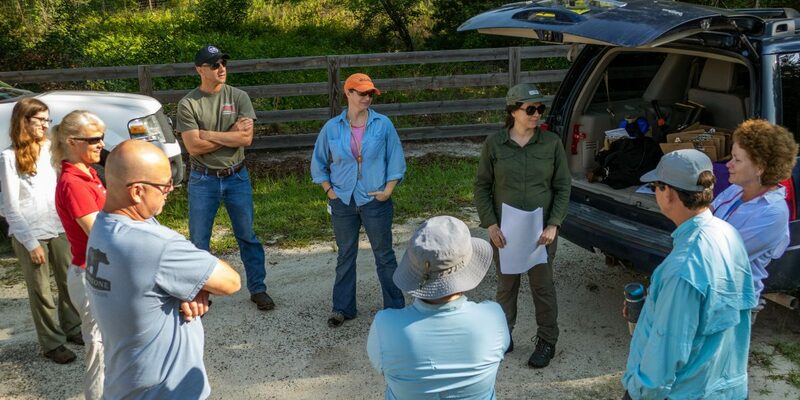 Emanuel is briefed, along with other land managers and scientists, prior to a day-long “bio blitz” at the district’s Silver Springs Forest Conservation Area. The team was at the property to gather information on the flora and fauna found on the property to develop a land management plan specific for the condition at this property. He’s been bitten by rattlesnakes, tangled with water moccasins and, as a boy, pursued anything that crawled or slithered while growing up in Huntsville, Ala.
Emanuel’s passion for science had nothing to do with aeronautics; his calling was closer to the ground, namely reptiles. Emanuel is still fascinated by reptiles, but the backyard grew bigger. A lot bigger. These days, Emanuel is responsible for the management of nearly a half million acres of the St. Johns River Water Management District’s public lands. In total, the district owns or manages 737,500 acres. The district’s main charge is to protect Florida’s water resources, but sometimes it can only be accomplished by buying land on, near, or surrounding a key water feature. As a result, the public benefits by having access to some of the most breathtaking and oftentimes undisturbed vistas in all of Florida. At the southernmost extent of the district’s jurisdiction is the serpentine boardwalk in the hardwood swamp at Fort Drum Marsh Conservation Area in Indian River County. Roughly 260 miles to the north lies Ralph E. Simmons Memorial State Forest (a district “partnership property” that the district purchased but is cooperatively managed with the Florida Forest Service). 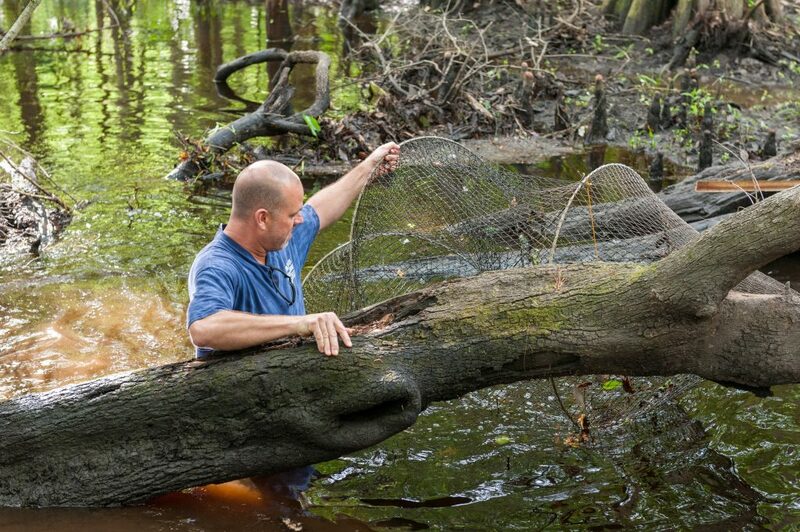 Brian Emanuel checks a trap for vertebrates and crayfish during a survey of the aquatic creatures found at the district’s Rice Creek Conservation Area. In between Fort Drum and Simmons, 41 district properties exemplify the best of everything natural Florida has to offer: restored marshes, longleaf pine forests, sandhills, scrub land, creeks, springs, lakes and rivers small and large (the 310-miles long St. Johns River being the largest waterway). Responsible for managing these diverse and widely scattered parcels is Emanuel, who succeeded Steven “Torch” Miller as chief of the district’s Bureau of Land Resources in fall 2018. But he’s not a newcomer to the agency; Emanuel began his district career in 2000, gaining valuable hands-on experience as a land manager. He also shared an office with Miller for 12 years, continually learning from the man who always seemed to wear several hats at once. “Brian brings a wealth of experience with district lands and the team responsible for their care. I’m excited to have him step into the chief position,” says Erich Marzolf, director of the district’s Division of Water and Land Resources. The district accomplishes its land management tasks with lean staffing: there are only six regional land managers, a forest manager, recreation manager and a handful of specialists and technicians who manage the district’s widespread public lands over 18 counties. At first glance, it might seem that managing a half million acres of district land would be as simple as posting signs, clearing a parking lot and erecting fences. In reality, there are a multitude of issues with which to contend: security, determining the most appropriate recreational uses for each property, maintaining trails, kiosks and other structures, managing invasive plants and animals, implementing restoration projects and minimizing the chances for wildfires by establishing a prescribed fire schedule. Keep in mind, district lands are unlike a state or county park system where recreation is the primary purpose. You won’t find “on-site” rangers to maintain a specific property. Yet, district land management staff maintain 41 conservation areas, more than 100 trailhead parking areas, more than 50 campsites, 300 miles of trails and a multitude of picnic pavilions, observation towers, boardwalks and related structures. For Emanuel, the key to successfully managing public lands is determining that delicate balance between the most appropriate recreational use of a property while maintaining its biological diversity and integrity, and advancing the district’s core missions. The headwaters of the district are mostly floodplain marsh and open water, which lends itself to bass fishing and airboating, while other properties are suited for birdwatching, horseback riding, hiking and bicycling. The only anomalies may be a seasonal interpretive drive at Emeralda Marsh Conservation Area in Lake County and the wildly popular wildlife drive at Lake Apopka North Shore. Since opening in May 2015, the wildlife drive attracts an average of 10,000 visitors a month. The 11-mile drive covers a network of wetlands, levees and canals, providing a variety of wildlife viewing opportunities. A free self-guided audio tour, which can be streamed through mobile devices and online, is also available along the wildlife drive and provides visitors with a narrative on the area’s history, wildlife and district-led restoration efforts. However, the majority of district lands receive a trickle of daily visitors, prompting the agency to promote its best-kept secret. In 2019, the district is celebrating its recreational offerings with an educational campaign, “Love your Lands.” The goal is to raise public awareness about district lands with online articles, social media posts and videos throughout the year. Winter in Florida is the best time to explore what we have to offer. Start by visiting our property listing to find the district lands and activities closest to you.